In Yvonne Louis's fascinating book A Brush with Mondrian, the author mentions that when Simon Maris's daughter, Mies, died in 1997 (at the age of 87) the artist Paul Gorter found two Mondrians in the Maris family house which are now at the Drents Museum, though not on display for security reasons. The images are from the museum's catalogue, a scan of which they kindly provided. 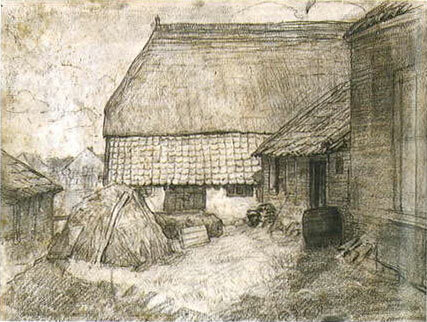 The first is Corner of Farmyard (Hoekje van Boerenerf), c.1897/99, black chalk, 31x41.5 cm. 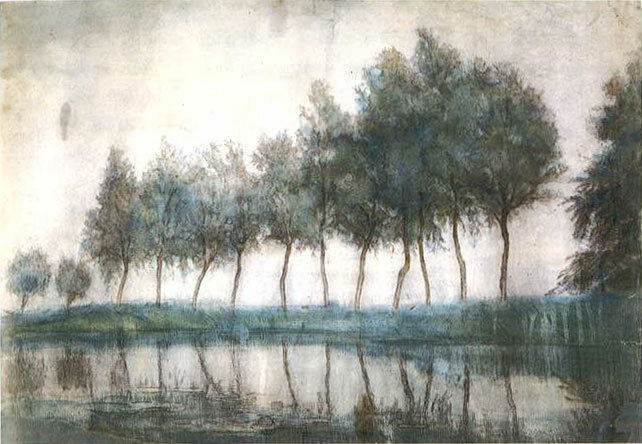 The second is Row of trees along the Gein (Rij bomen langs het Gein), c.1906/07, chalk and watercolour, 59x84 cm. I cannot find either image in the Catalogue Raisonne, although there are several paintings similar in subject, though not in size, to the watercolour. And, of course, Yvonne Louis might have a new Mondrian too.